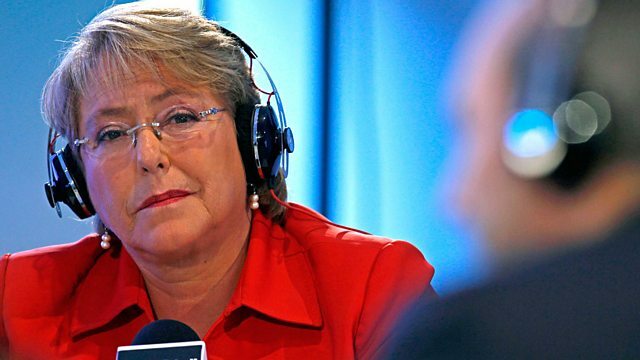 Edward Stourton tells the story of Michelle Bachelet's extraordinary journey from torture and exile to power in Chile where she appears likely to secure a second term as president. Edward Stourton profiles the Michelle Bachelet, the favourite in this weekend's presidential election in Chile. If Bachelet wins as expected, then it will be her second term as president of a country which elected her to office in 2006. Bachelet took 47 per cent of the vote, almost twice as much as her rival, in the first round but it was not enough to secure an outright victory. Bachelet's family were victims of the coup in Chile under General Pinochet in 1973. Her father, an Air Force general who refused to go along with the actions of his brother officers, died after being tortured. The regime also tortured Bachelet herself - and her mother - before allowing them to go into exile, first to Australia and then to East Germany, where they joined many of their compatriots. Profile talks to a fellow Chilean exile who knew Bachelet when she was a student in the GDR, the speechwriter who helped her to victory seven years ago and a British diplomat who helped to sell Chile some second hand frigates and was impressed by Bachelet's plain-dealing.